Hello Readers! And Happy Spring! Well, you’ve probably noticed that I haven’t blogged in a bit. 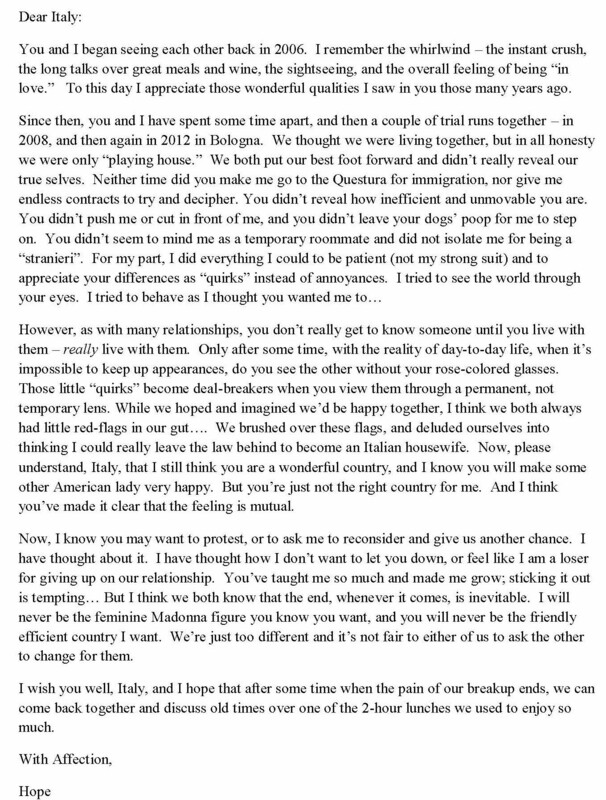 That’s because I’ve been composing this “Dear John” letter to Italy (okay, in all honesty I wrote it in about 10 minutes and have been mulling it over). I was trying to remember if I’d ever actually written a “Dear John” letter before and I don’t think I have. I prefer face-to-face when it comes to serious subjects. However, in this case, this is as close as I think I can get. Speranza! Does that mean you’re returning to the U.S. and the law? Are you SURE you’ve never written a “Dear John” letter before? Because this one–which you profess to be your first–is pretty darn good! It strikes the right balance between the worn-out and overused “It’s not you–it’s me” and “Dear Aunt Em, Hate you, Hate Kansas, I’m taking the dog.” I’m looking forward to the next chapter of your life adventure–whatever that is! I’m with Pete – this is really your first? It is so well written and poignant that I feel a sadness for Giovanni even while I know “he” is hardly blameless…the cad! I sense this has been building up for a while Hope. Was there a straw that broke the camel’s back? I will certainly miss your astute and amusing observations on “la dolca vita” in Italia but I know this is not a decision that you have made on a whim. Miei migliori auguri! Hi and thanks for your comments/concern. There were several things, some of which have nothing to do with Italy per se; while I try and be open and honest on my blog, not everything is for public consumption…. A turn on the road of life. I hope the next stretch treats you well. Just keep blogging. So well written, and so applicable to even one’s home town. Thinking about writing the same letter to our current city. Thanks for the template! Thanks – and thanks for stopping by my blog! A lovely letter, albeit a bit sad… Does this mean you’re going back to the states? I hope that you can still continue to enjoy Italia, even if it’s not on a permanent basis. Forza!